Finely crafted in the USA from North American Hardwoods, sanded, ready to finish in either stain or paint. Add custom detail above or below cabinetry, on and around hoods, bathroom vanities, and more. The Gaelic Light Rail Insert accentuates traditional Irish design with it’s carved interlaced knotwork patterns. 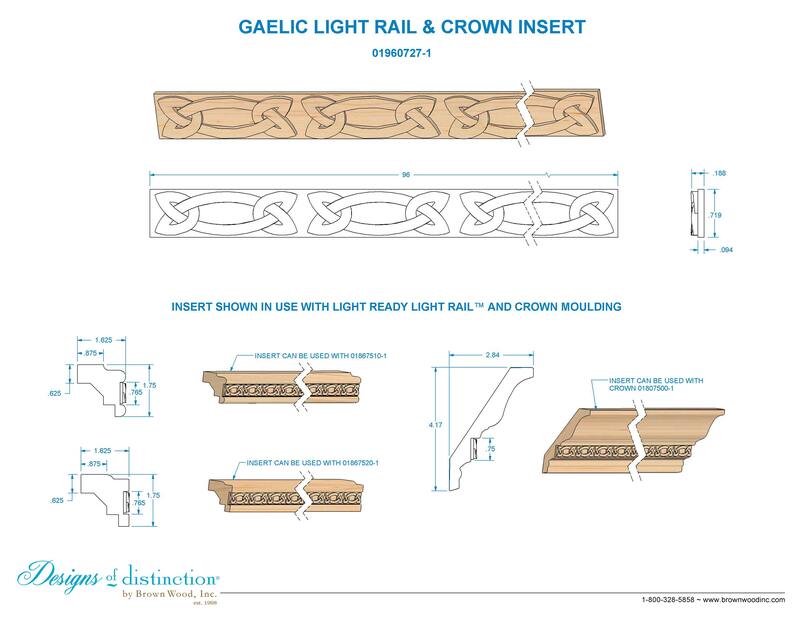 The Gaelic Light Rail Insert is beautiful when used on it’s own or combined with our Traditional, Contemporary, or Crown Light Rail Moulding. The Gaelic Light Rail Insert is part of our Gaelic Collection. Add our lighting kits to create task or ambient lighting in kitchens, baths, dens, bedrooms, and more. Shop more of this look in the Gaelic Collection. Call or submit a quote for custom species.